The Tornado, outside Tails' Workshop in Sonic Adventure DX: Director's Cut. The Tornado is a small red bi-plane which serves as Sonic and Tails' principal means of long-distance travel in the Sonic games and most other media. It was first seen in Sonic the Hedgehog 2 (16-bit), where it appeared above West Side Island in Sky Chase Zone. Originally owned by Sonic, responsibility for the airplane seems to have passed to Tails as the series has progressed. Starting in Sonic Adventure, there have been several different versions and remodels of the plane. The original red plane appeared in Sonic 2, but reappeared in Sonic 3, Sonic & Knuckles, Sonic Triple Trouble, Sonic Advance, Sonic Adventure, and Sonic Chronicles: The Dark Brotherhood. Over the course of this time, it has gone over major revisions, starting out as a cartoonish bi-plane, then getting a jet booster added to the bottom by the end of its first appearance in Sonic 2. In Sonic Adventure it was redesigned into a more realistic plane with guns and missile launchers but the booster was built into its bottom. By Sonic Unleashed, it was again redesigned into a cartoony futuristic looking plane (the Tornado-1) with a jet mode transformation. Here Sonic and Tails use the Tornado to fight off swarms of enemies in Tornado Defense. This is done via QTEs, and also has a boss fight, the Egg Cauldron. It reappears in Sonic Lost World, sporting a visual closer to the original's, with details in silver. Used primarily in cutscenes, it has a bonus level for itself in the Hidden World towards the end of the game. During Sonic Adventure, a new blue plane made by Tails appeared, called the Tornado II. 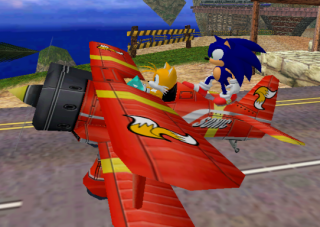 Its plane mode is similar to the Sonic Adventure design of the original red aircraft, but this vehicle is powered by a Chaos Emerald to improve upon the original. As well as the minigun and missiles, it has the additional ability to transform into a jet mode - the X-wing type configuration first seen here. Tails made the mistake of forgetting to install landing gear into the jet mode, leading to a bumpy arrival on the Egg Carrier Adventure Field. Big later flies it away from the Carrier, and it ends the game crashed in a river next to the cat's house in Mystic Ruins. In Sonic X, the Tornado II is Tails' plane of choice during the first few episodes of the series. It is actually the original red Tornado that was redesigned and repainted. In the eighth episode Satellite Swindle, its inability to travel through space makes it incapable of defeating Eggman's robot Super Sweeper, so Tails builds the more advanced X-Tornado as a successor. After that, the Tornado II makes one last appearance in Memories of the Wind where it transforms into the Hyper Tornado (a going away present from Chuck). This blue plane also cameoed in Team Sonic's opening for Sonic Heroes, and appears in the Special Stages of Sonic Advance 3. Sonic Adventure 2 introduced another new plane by Tails called the Tornado III. This new version only flies in a jet setting, but has the additional ability to transform into the Cyclone and an automobile. This version later reappears in Shadow the Hedgehog (game), although only in its plane configuration. Tails created a small bi-plane from leftover scrap metal in one of Eggman's invasions called the Tornado Racer. He uses it for his race car in Sonic & Sega All-Stars Racing. It is capable of tighter turns than normal aircraft, which helps him in races. The Tornado III in Cyclone mode. This page was last edited on 17 February 2018, at 13:00.